Browse Artists and Groups A.J. Casson, C.M., O.Ont., LL.D., R.C.A. Born in Toronto in 1898, Alfred Joseph Casson is best known for his landscape depictions of forests and farms in southern Ontario. He first studied art at Ryerson School, then at the Hamilton Technical School after his family moved to Hamilton, Ontario. In 1919, at the age of 21, he was hired as a designer by a commercial art firm, Rous and Mann, and worked under the guidance of Franklin Carmichael. 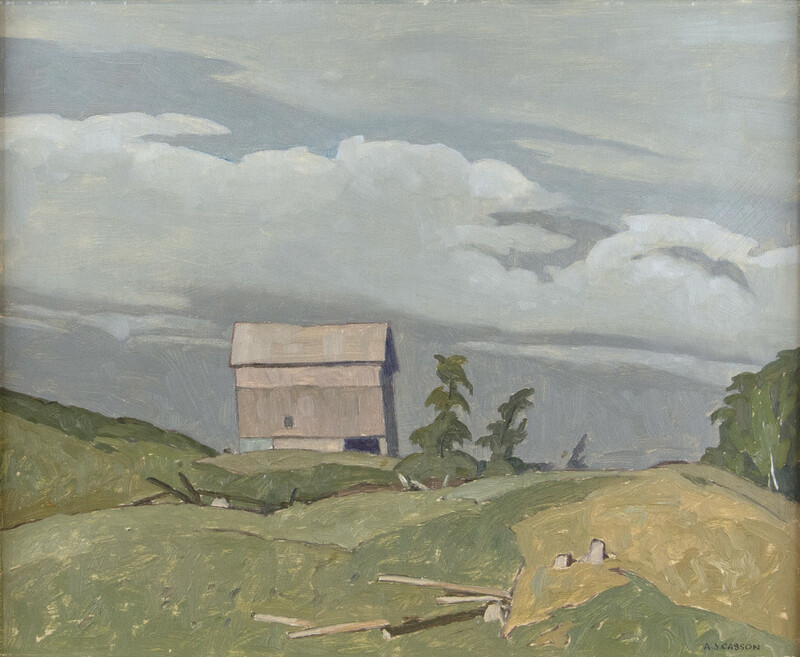 Casson soon started taking weekend sketching trips with Carmichael and was introduced to the other members of the Group of Seven. Casson was a fine watercolourist who, together with Franklin Carmichael and F.G. Brigden founded the Ontario Society of Painters in Watercolour in 1925. The following year he accepted an invitation from Carmichael to join the Group of Seven. In 1927, he left Rous and Mann to join the printing firm Sampson Matthews, where he became art director and, later, vice-president. After the breakup of the Group of Seven, he co-founded the Canadian Group of Painters in 1933. Casson continued to work as a commercial artist until the age of 60 and thereafter continued to paint full time. A prominent member of Canada's artistic community, he served as president of the Royal Canadian Academy of Arts (1948-52), president of the Ontario Society of Artists (1941-44) and served on several boards, including the Art Gallery of Toronto (now the Art Gallery of Ontario) from 1955-59. Casson died in 1992 at age 94 and is buried on the grounds of the McMichael Canadian Art Collection, along with the other Group of Seven members. Please send me more details about the following artist. A.J. Casson, C.M., O.Ont., LL.D., R.C.A. titled and dated in typeset artist's label, "Farm at Fairmount / 1972" and signed in blue ink, "AJ Casson" (verso, upper right).